. As Rokslide’s editor, I’ve read every Stone Glacier backpack review we’ve ever done, including many from our members. The common thread in these reviews is that Stone Glacier scores well in quality, durability, and customer service. 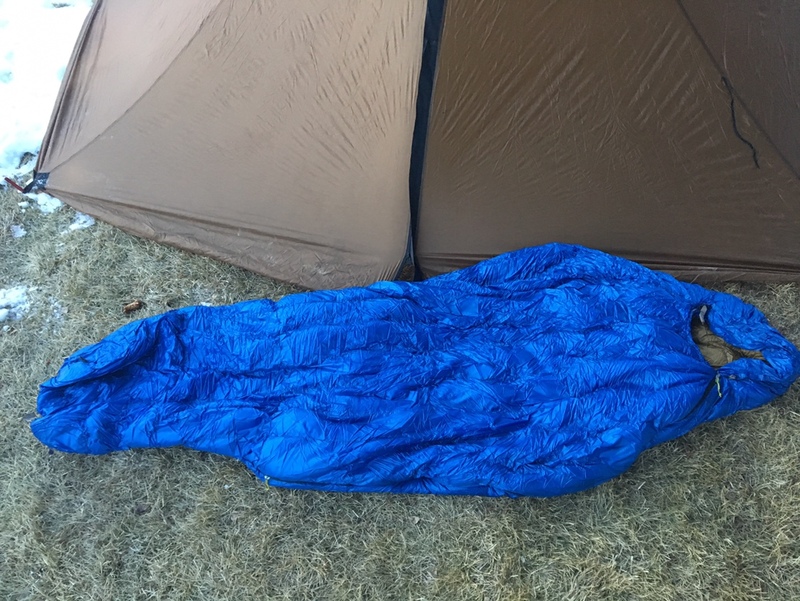 So when Stone Glacier decided to expand their business beyond backpacks, I raised my hand to test their new Chilkoot 15° Sleeping Bag. 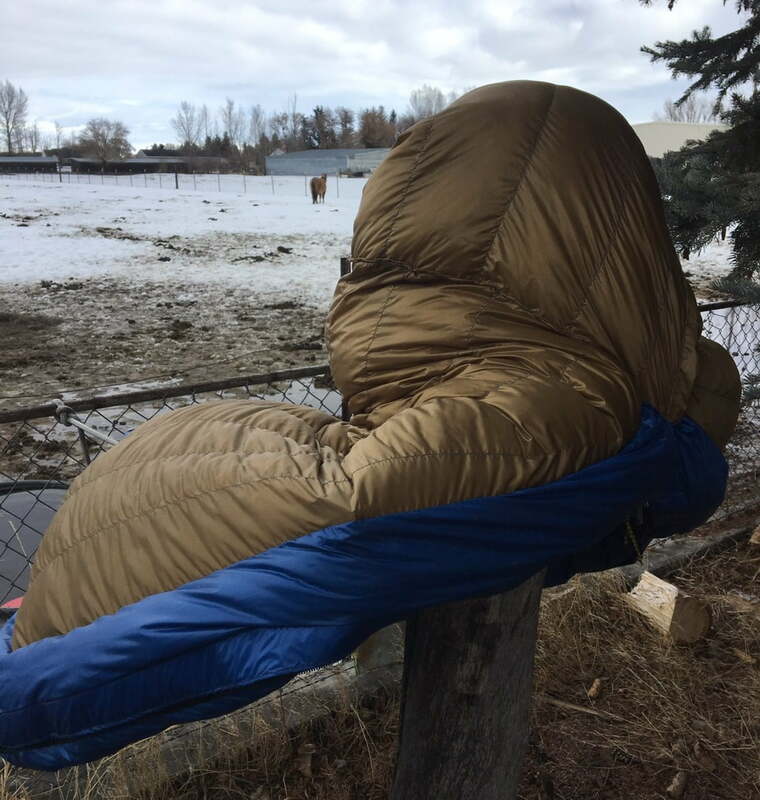 This is a modern down bag designed for the weight and space conscious hunter. 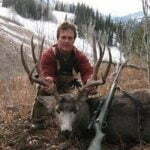 Down fill, while among the warmest per weight ratio of the insulations, makes many hunters nervous due to its reputation for losing all insulating properties when wet. This is a valid concern but I think you’ll see that Stone Glacier has all but eliminated that worry. First, a little history on me. I’m not primarily a backpack hunter, but use horses for accessing the backcountry. 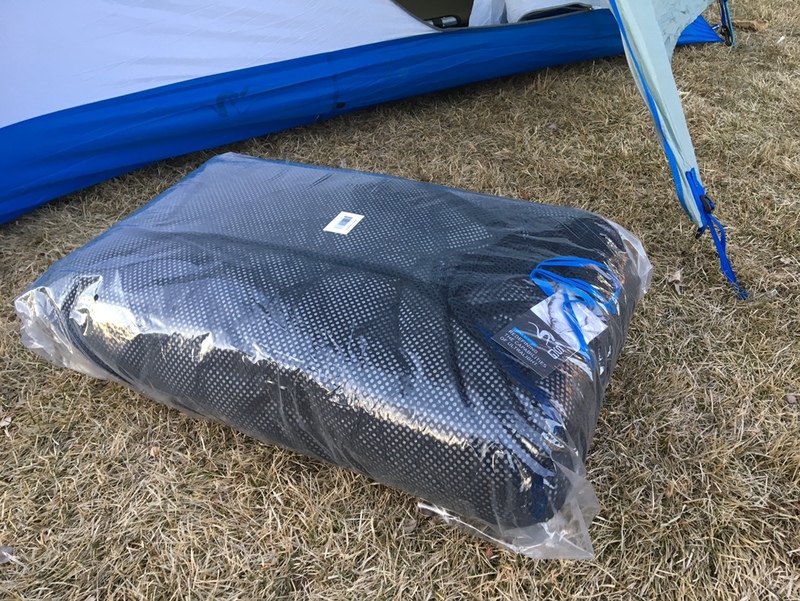 I might make one to two overnight backpack trips per year (see my review on the Stone Glacier EVO 3300 pack here), but I still gravitate towards the lightest highest performing gear. Even when using horses, pack weight and bulk are important considerations. 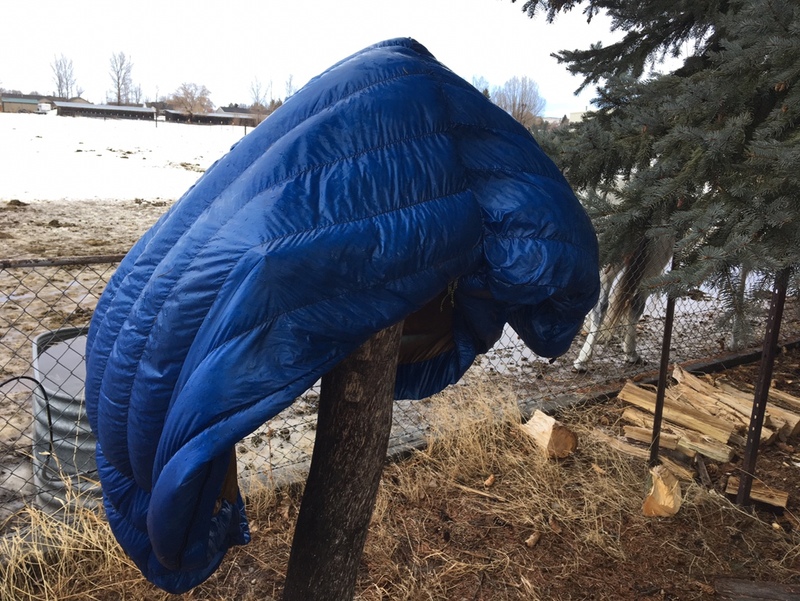 I realize this doesn’t lend well to testing a bag’s true temperature rating, but it seems to me that science is pretty subjective anyway (see Wymer’s “Understanding Sleeping Bag Temperature Rating” here.) I’ve learned over the years to use the clothing I’m bringing along to up my bag’s temperature rating, allowing me to bring a lighter bag. 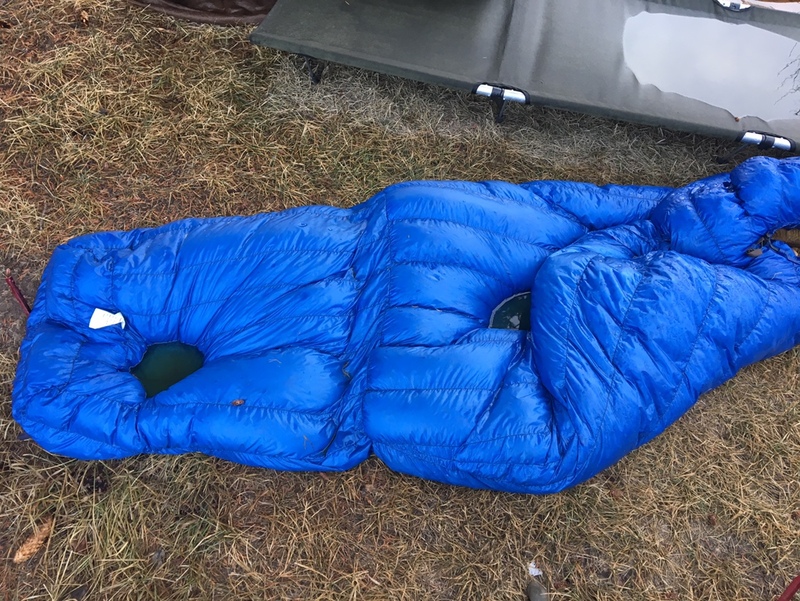 It makes no sense to sleep in a heavier bag while my jacket and pants are laying in a pile on the tent floor. I’m better off to test a bag exactly the way I’d use it on the mountain and and let you draw your own conclusions. I received my prototype bag in late January, 2019, a long ways from my fall hunts. 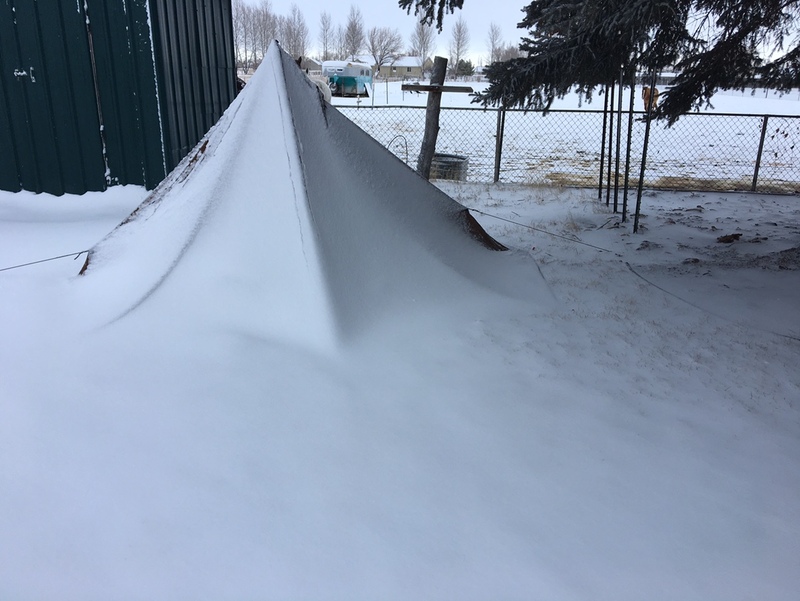 However, the conditions in late winter in my hometown of Iona, Idaho aren’t much different than the October storms in the high country of the West. 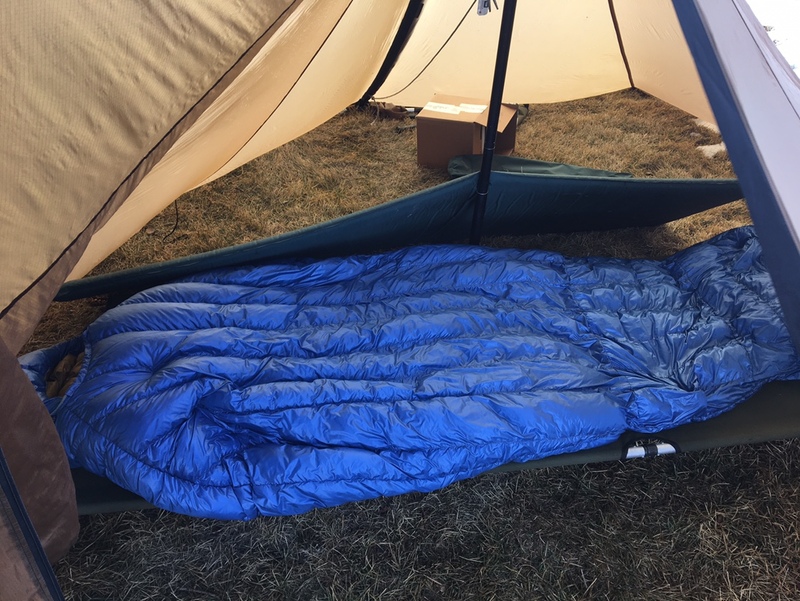 For this review, I used both a floorless and a floored tent as I could be using either when employing a 15° bag. 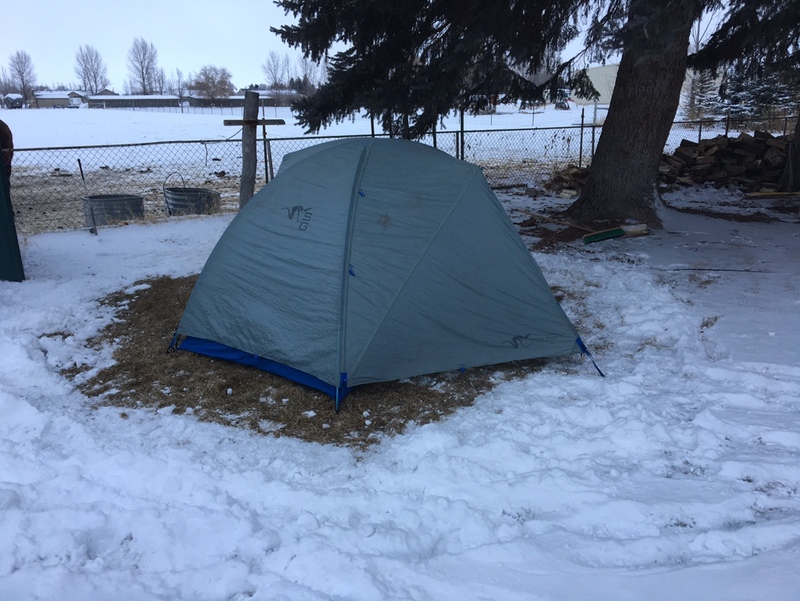 Although there was six-inches of hard-packed snow in my backyard, the afternoon sun had melted off some bare grass under my Colorado Blue Spruce trees, so I was able to set up on dry ground. However, the ground was frozen so I was only able to pound the stakes down a few inches (that will play right into this test later on as you’ll see). 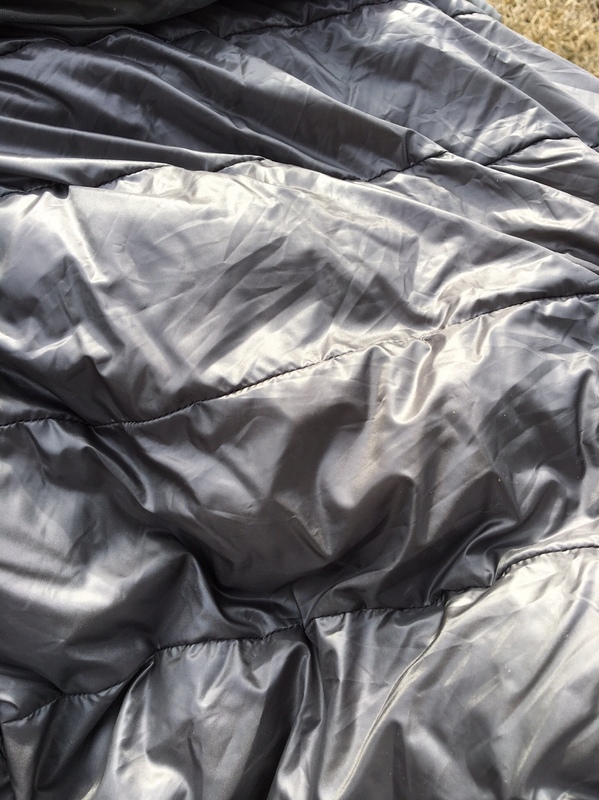 According to Stone Glacier, the only difference between my prototype and the production Chilkoot would be color (mine was blue, production is a silver/gray); and that the prototype was hand-sewn, meaning the production bag would be tighter in the seams. At 10:30 PM on the night of February 1st, the outside temp was 25-degrees. I kissed the wife goodnight and headed outside. 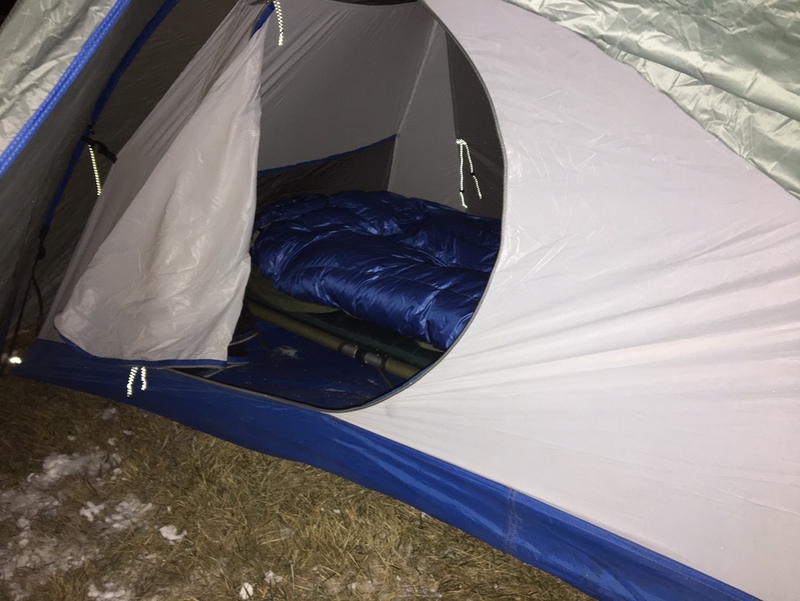 She shivered at the thought of me sleeping out there but those are mild temps compared to late October in the high country, so I wasn’t worried. 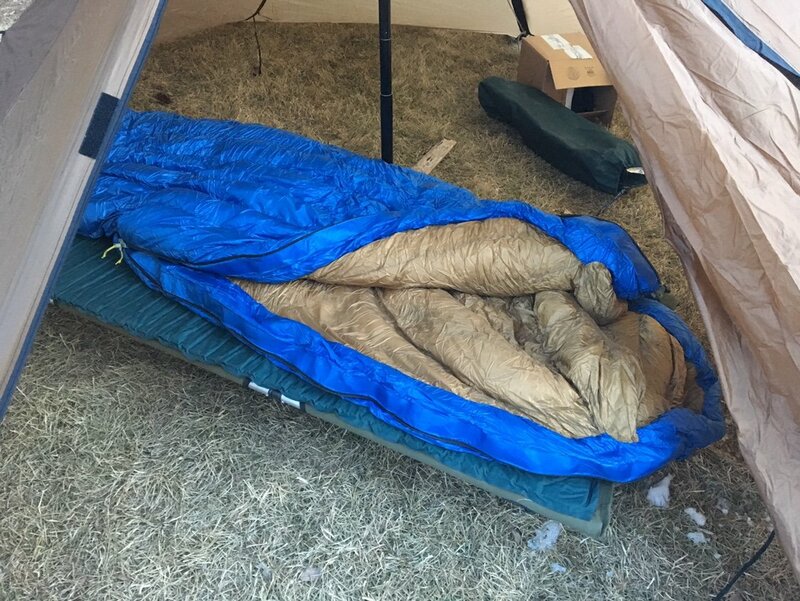 I set up my E-Kot under and a Thermarest and laid the Chilkoot out. Crawling in the bag for the very first time, I found there was plenty of room around my shoulders. I could clasp my hands together across my chest and spread my elbows out fully, just touching the sides of the bag. The 2/3-zip formed a foot box around my feet with some wiggle room for movement but didn’t seem too big so my feet could get cold. 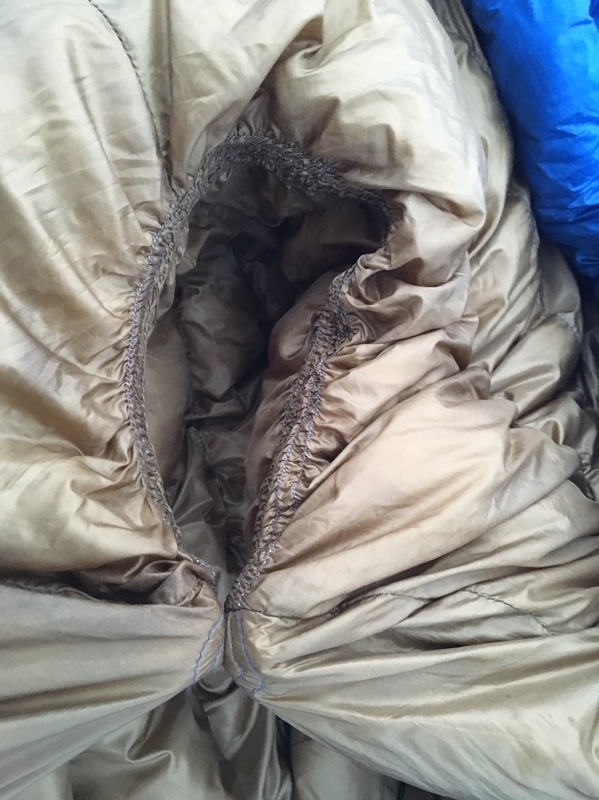 I had a light down pillow in the hood of the bag that didn’t quite allow me to zip the hood completely closed, but the collar inside the bag kept any drafts from sinking into the bag (there is a magnet closure on the collar, but I didn’t use it that night). My horses munched on a hay bale just a few yards away as I drifted off. I woke up around 1:00AM. The outside temp was still in the mid-20’s as it had clouded over a bit, keeping the temps up longer than I expected. I wasn’t cold at all and only woke up because I had to take a leak. Back in the bag, I was asleep in minutes. The alarm vibrated to life at 6:00 AM, but I lay in the bag for a bit longer. I was still warm but had woken up in a semi-fetal position on my side (bag is roomy enough to allow a guy my size to roll around—nice!). Although I wasn’t as warm as I had been earlier in the night, I never got chilled. I headed in the house and checked the outside temp: 21°–pretty close to rated 15°. The forecast said the next few nights were only going to get down into the high twenties as a snowstorm was coming in with some warmer temps. I decided to just leave the bag out there until the temps dropped again. This is where the real test was about to begin and I didn’t even know it! Saturday night, I stayed in the house as the big wet and windy storm was rolling in off the Pacific. Sunday morning I was up with the sun. I was making coffee when I remembered “camp”. It had rained and snowed over night and the wind was blowing, so I was very curious. The temperature was already above freezing at 8:00 AM. If I was on the mountain, this could mean the end of a hunt or worse. 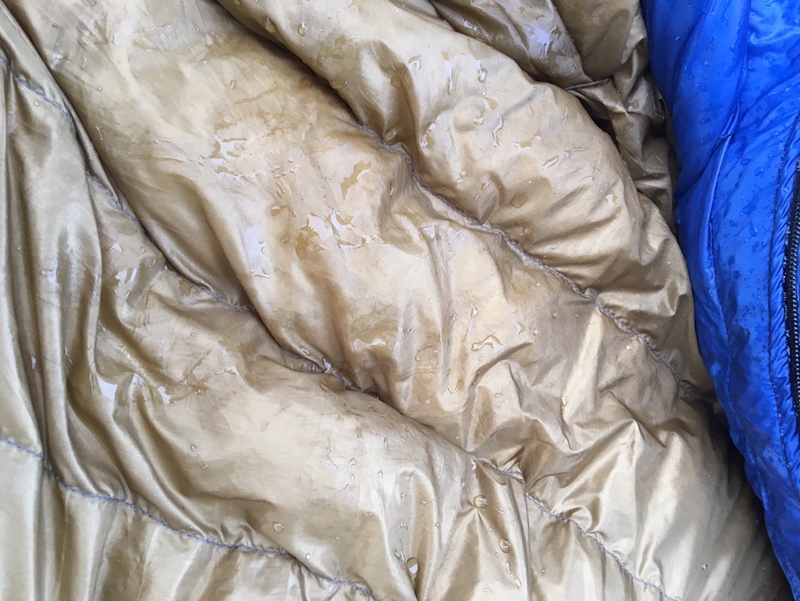 Yet when I zipped open the Chilkoot, I found very little water inside–mostly water beads and just a little dampness in the bag, but nothing soaked. The down was not even clumped. The weather report said we were set for an incoming snowstorm that evening. I decided it was time to take this review to a whole new level. I set the tent back up on the newly thawed ground and was now able to pound the stakes all the way to their collars. Shaking the bag free of all standing water, I draped it over a post to let the wind have at it, and then did the same thing with the cot and the pad. There was a little rain still falling, but the bag was able to shed it and actually dry out in the wind. After the first hour, the outside of the bag felt dry to the touch just about everywhere I felt it, so I turned it inside-out and put it back on the pole. Another hour later, I couldn’t feel any dampness in the bag. I shook it to restore some more loft then put it back on the now dry cot and pad in the tent, then closed it back up. 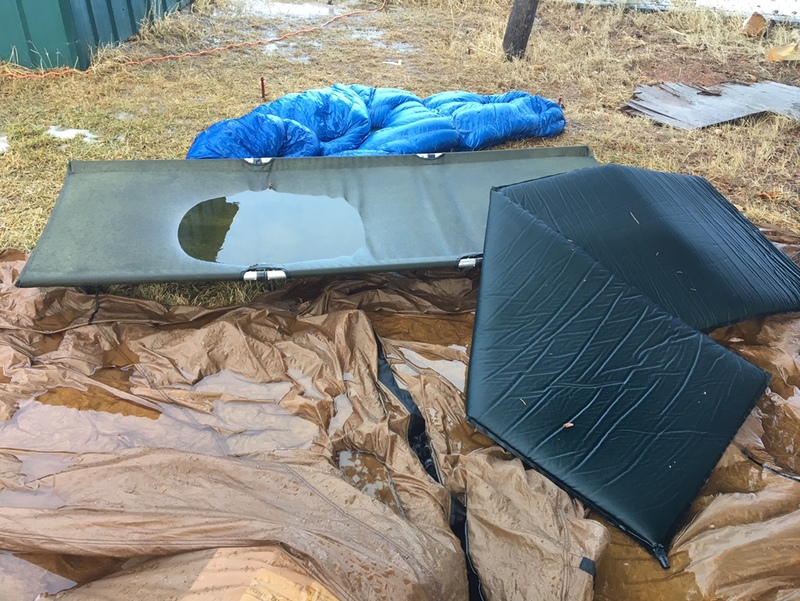 Snow, rain, or pain, I committed to sleeping out that night, just to see if the Chilkoot could recover from this event. I hit the sack at 10:00 PM. The bag was dry to the touch and I felt no wet spots when I got in–amazing considering the bag was soaked just hours earlier. Temperature was in the low thirties and held steady all night as I got blasted by more rain and slushy snow. 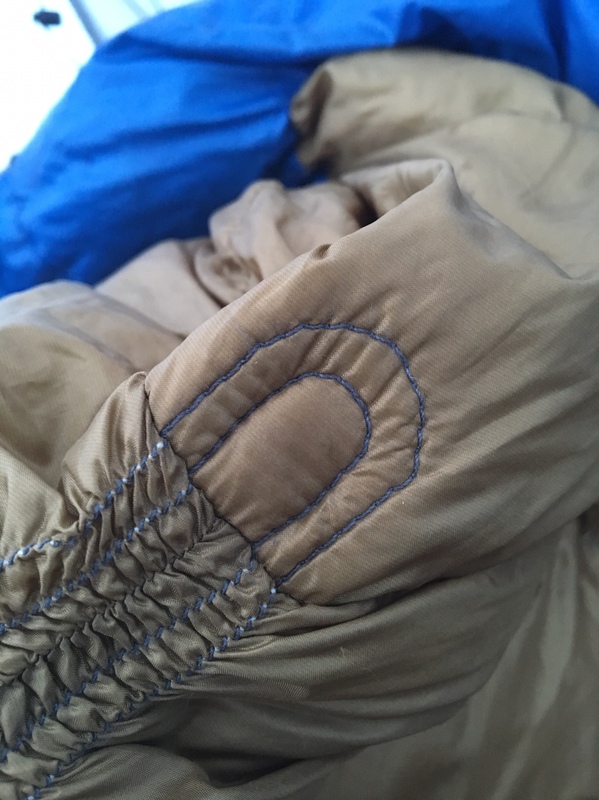 As it was 10 degrees warmer than the first night, I ended up zipping the bag open in the middle of the night and removing my gloves. When I returned home that evening, I checked the bag. It rained and snowed almost all day with temps in the upper 20’s to low 30’s, but all that dampness that was on the outside of the bag was gone! 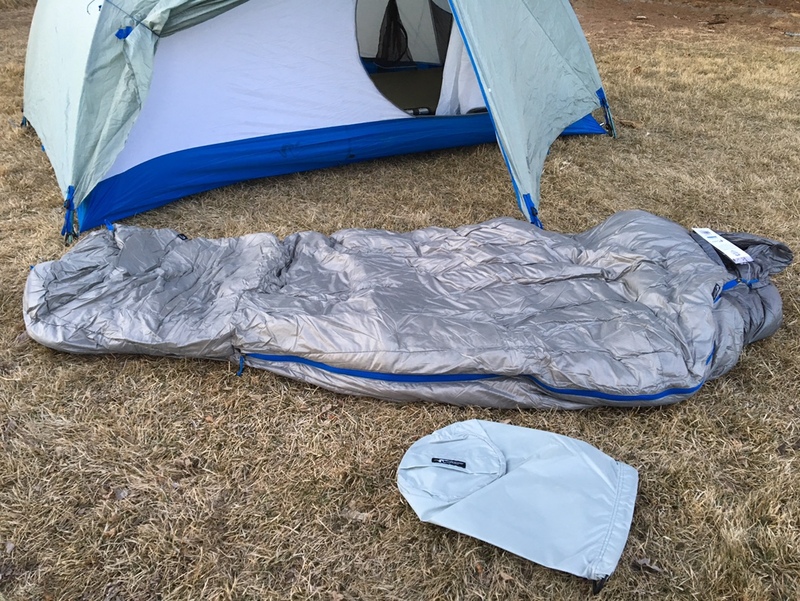 With all the snow and wind, I decided it was time to break out the 4-season tent: Stone Glacier’s new Skyscraper (see Josh Boyd’s full review here). 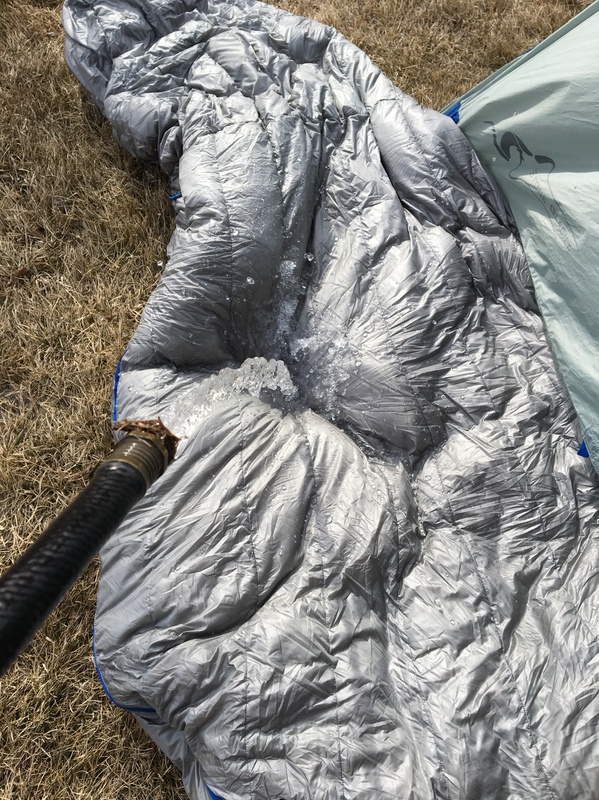 I used this tent a lot last year in the early season, and wanted to give it a true cold weather run. I pulled down the Cimarron and laid out the Skyscraper in its foot print. 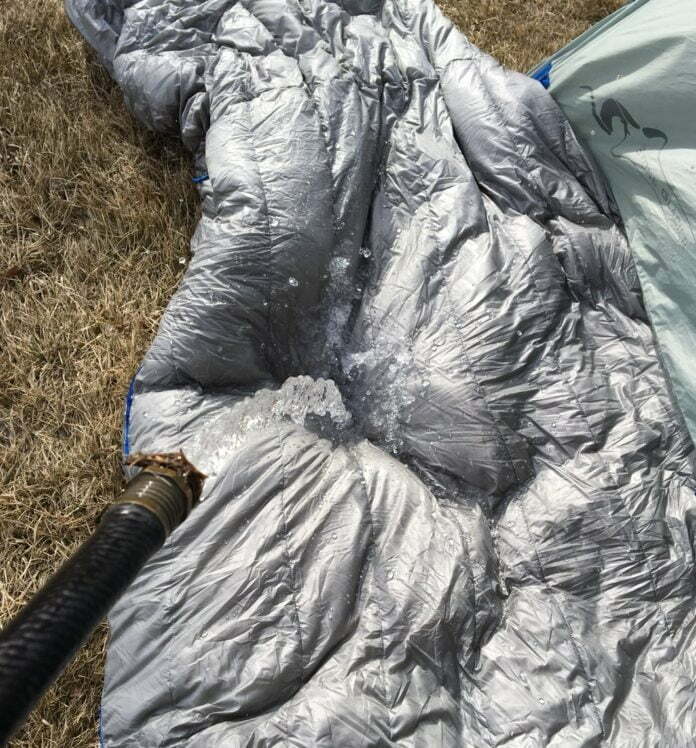 With temps forecasted to the bag’s limit of 15°, I donned my final layer that I’d have on a hunt: my First Lite Obsidians. As I said above, I use my clothes I’m bringing anyway to drop the bag’s temp rating and save bag weight. I climbed in bed to gusting winds and temps in low 20s. With the coldest night yet predicted, I used the collar. It’s tricky to align the magnets, but with some effort, I made it happen. I must’ve been warm because I never woke until 4:30 AM when I had to take a leak. If I’m gonna get cold, it’s usually my feet but they were fine. Back in the sack, I slept until 6:30, still warm. Once in the house, I checked the temp and it was right at the Chilkoot’s rating of 15°. I hit it the sack at 11:00 PM in four-degree temps and zipped in tight with just my nose/mouth exposed from the bag’s hood. Sleep came easy. I slept warm until about two hours before the alarm went off, when I started to feel a chill. I rolled onto my side into a semi-fetal position and pulled in all the vacated dead airspace so the bag was tucked snugly around me. That did it and I slept well enough considering I was at least 10-degrees below the bag’s lower limit. At 6:30 AM, I got up and and headed back in house. 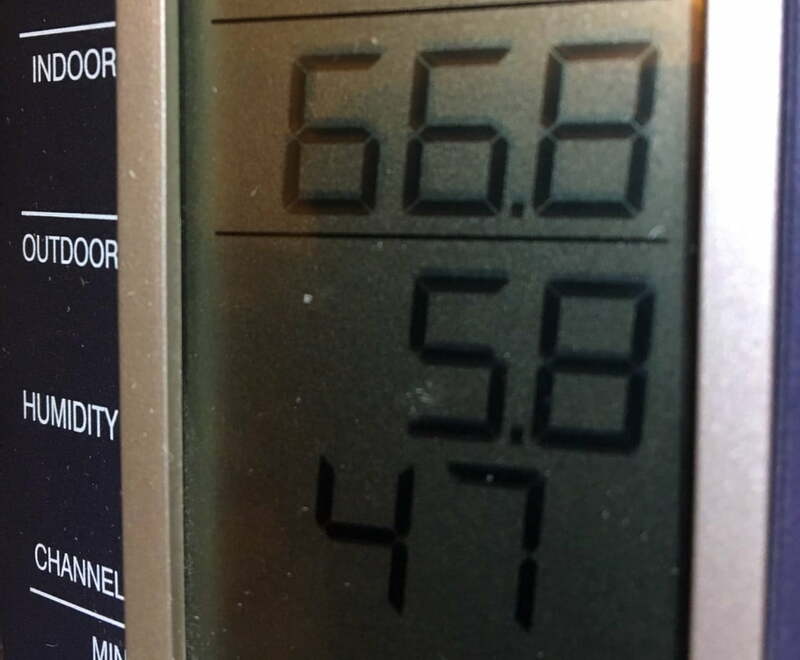 Weather app said it was 1°, while my thermometer said 5.8°. My new production series Chilkoot 15° bag arrived about a month later. Checking the weather, I only had one more evening of temps forecasted near the 15° mark. With that report, I had the Skyscraper back up in a few minutes. All the snow was gone by now. I saw no indication that the production Chilkoot is any different than the prototype in the temperature department. Looking back to earlier in my test, I was overheating in the bag when it was in the 20s in my same test clothes. Next step was to soak this bag. Using the garden hose, I hit it with about a quart then let it sit a minute. It pooled water across the baffles. I opened the bag and saw no indication of leaks, just like the prototype. Simply amazing. 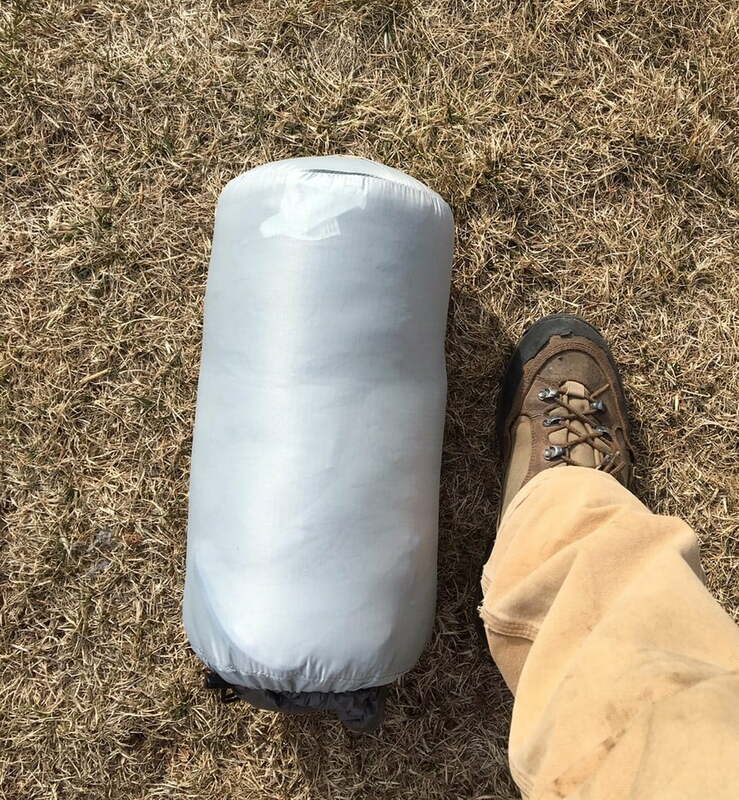 I also weighed the new Chilkoot in the newly included stuff sack. 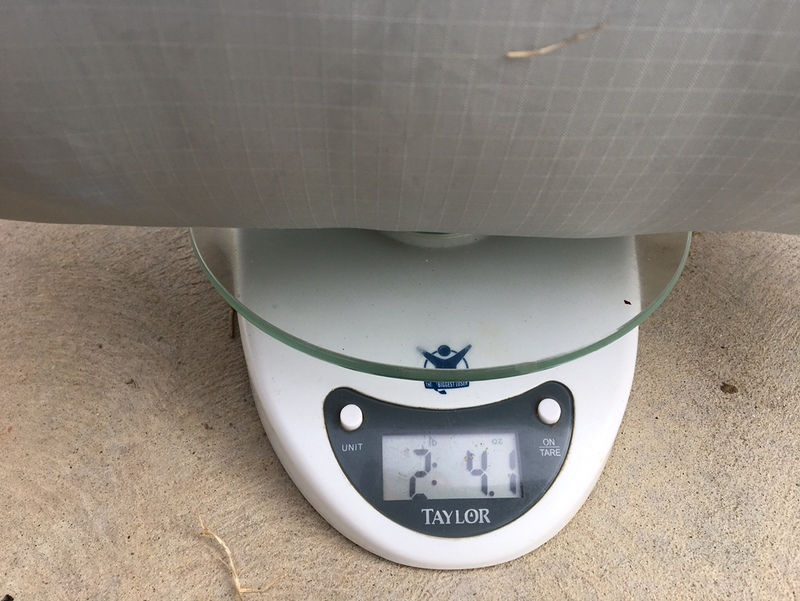 The stuff sack weighed 1.4 ozs, while together, they hit 2 lbs 4 ozs; the math says my production bag on my scale is 2lbs 3ozs, exactly as advertised. Packability is also great with an advertised 7″ x 15″. 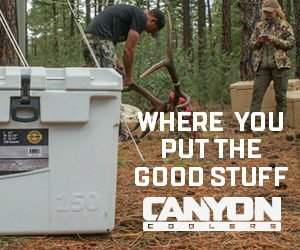 In summary, I can’t imagine what more to ask for in a modern down fill bag. 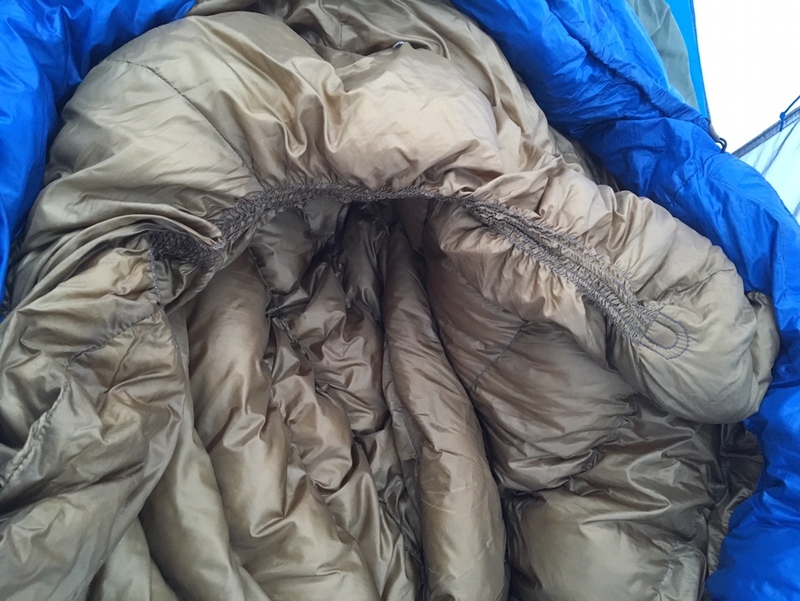 With Stone Glacier’s inclusion of YFuse Pertex Fabric, SuperDWR, and HyperDry Down, they’ve nearly eliminated the “down” side of down fill, as I showed in this review. It goes without saying that this Stone Glacier Chilkoot 15° will be in my pack and panniers for this fall’s hunts. *There is also a 0° version of the Chilkoot available here.